Well, it seems I have taken a little blogging break for the week. And although I have missed keeping up with you all, I have a good excuse. I started my own business!! I am now an official “Independent Beauty Consultant” and am having a blast! I’ve started wearing make-up on a regular basis, which might be selling out a bit as I’ve never been much of a make-up person, but it’s really “all about the skin-care”. And, I’ve been using cleansers and moisturizers for fifteen years. Anyway, I’m linking up to my website if you’d like to take a look. I will be setting up a pay by credit card option within the next week. And finally, today is my niece’s first birthday. She’s so cute she won the local news’ baby of the week picture contest!! Happy Birthday, Baby O!! Your niece is adorable. Congrats and good luck with your business. Yay for your starting your business! Woohoo :)Your niece is adorable! Congrats on starting your business. I hope it goes well for you and you enjoy it. 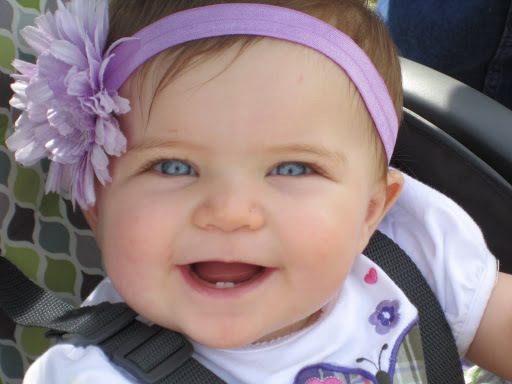 Your niece is a cutie pie…those eyes!